In the end of August 2015 was organized first out of five planned Regional meetings of Association “National Network of Health Mediators”. In the Regional meetings the floor was given to the HMs to talk about their work, how they cooperate (or not) with local authorities, the problems of the communities which change through time. On every meeting HMs elected 6 delegates who are going to represent them at the National meeting for Strategic planning that will take place in 2015 and will gather all delegates from all over the country. In April 2015 National Network of Health Mediators` team started developing educational tool for Health mediators on Hygiene topics. 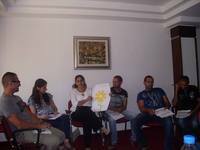 After preparatory work and submitting information about main hygiene issues in Roma settlements and neighbourhoods, on 13-15 July 2015 in Sofia was organized workshop aimed at Hygiene for 9 HMs from 5 places. In the Workshop also took part our colleagues from Bulgarian Family Planning Association (BFPA), a representative from Regional Health Inspectorate - Sofia District and a painter-designer Elitsa Atanassova. The premiere took place on 12 June 2015 in Sofia. The event was attended by representatives of National Council for Cooperation on Ethnic and Integration Issues, Ministry of Labour and Social Policy, Employment Agency, World Health Organization, NGOs. Field-trip was part of Regional Conference “Health and rights promotion, decreasing inequalities. The way to better sexual and reproductive health in Eastern Europe and Central Asia” that took place in the period 27-29 May in Sofia. The Conference gathered representatives from 19 coun-tries in the region. It was organized by Ministry of Foreign Affairs, Ministry of Health and Regional Office of UNFPA for Eastern and Central Europe. 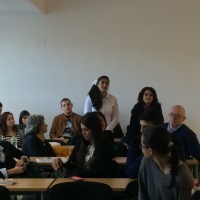 On 2 April 2015 Health mediators and Roma students in medical specialties took part in a seminar, organised in New Bulgarian University, Sofia, by Department Political Sciences, Department Health and Social Work and Department Cognitive Science and Psychology jointly with Ethnic Minorities Health Problems Foundation and the National Network of Health Mediators. Prof. Ivayo Tournev, Chairman of Ethnic Minorities Health Problems Foundation, presented the development of Health-mediation programme in Bulgaria. Prof. Tournev pointed out that the main factors for improvement of the Programme are the strong motivation, stubbornness and desire for change of his associates, colleagues and Health mediators over the past 15 years. This web site is funded by the EU. The content of this site is a sole responsibility of Consortium led by Open Society Institute - Sofia with organizations ICON, EMHPF and BFPA and can in no way be taken to reflect the views of the European Union. The history of the National Network of Health Mediators dates back some ten years ago, when in Bulgaria the serious problems in the sphere of health care and especially the limited access of minorities to the system of health services began to be mentioned. The almost non-existent health culture, high sick rate, serious disabilities leading to permanent deviations, problems with diagnostics of illnesses that are comparatively easily spread such as tuberculosis etc., infant and mother mortality rates outline the alarming picture if the Roma population health profile. The introduction of the profession of the health mediator is a new and unfamiliar model for Bulgaria, which aims to begin to overcome the problems related to health services for disadvantaged groups of society. During this period, serious progress has been achieved thanks to the continuous efforts of the present network members. The efforts of all stakeholders continue, but already united in a National network of health mediators. The National Network of Health Mediators was established on April 23 in Sofia. Stakeholders and citizens who have been supporting the introduction of the figure of the health mediator during the past few years. The idea for the establishment of a network of the health mediators has been developing throughout the years to become a fact to date, when 50 health mediators from more than 25 municipalities all over the country have been appointed at work. During the period 2003-2006, within the framework of several projects, more than 85 health mediators from the whole country have been trained. They have been prepared by one and the same interdisciplinary team under a programme, approved by the Ministry of Health. The team of trainers is also part of the National Network of Health Mediators. Supportive national and local institutions. To participate in civil society development, democratisation and transparency in the actions of the central and local governments by implementing civil initiatives and cooperation with government institutions, local and regional authorities. The National Network of Health Mediators unites more than 80 members. More than 65 of them are health mediators, trained and certified by the Ministry of Health. 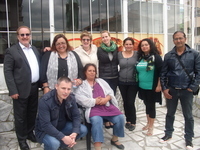 HM work in Roma quarters, with different risk groups from their community. They speak Romany language, know the health and social legislation, as well as the specific problems of each municipality in which they work and live, and have built good partnership relationships with municipal and regional experts on ethnic and demographic issues. They are also well known and accepted by the local health institutions such as the Regional Health Care Centres, the Regional Inspectorates for Public Health Care, etc. * Work with municipal administration and local authorities for clarification of the importance of the health mediator’s position and role – campaigns, information meetings, etc. * Development and optimisation of the health mediator position through: continuous training and additional qualifications; improvement of the health mediator job description; introduction of training programme (syllabus) at a college or university for health mediators, etc. * Work with the community – and improvement of the HMs work with the community for increasing the Roma’s health awareness. The Network’s Board Chair is Peter Tzvetanov from the village of Septemvriitski, Vulchedrum municipality, Monatna District, who works as a health mediator as well as participates in build up training of health mediators. Network Board members are the health mediators, experts and doctors. An Ethical Commission has been established with the National Network of Health Mediators. It monitors the observation and compliance with an ethical code, regulating the responsibilities and moral obligations of the health mediators-network members. The Ethical Commission Chair is Olya Stoyanova, who has been working as a health mediator for three years at the Municipality of Dupnitsa. The Network’s Board of Directors presented their goals and mission to representatives of the Ministry of Health, Deputy Minister of Labour and Social Policy, the Royal Dutch Embassy in Bulgaria, representatives of the National Council for Ethnic and Demographic Issues and the Ethnic and Demographic Directorate at the Council of Ministers, donor organisations.